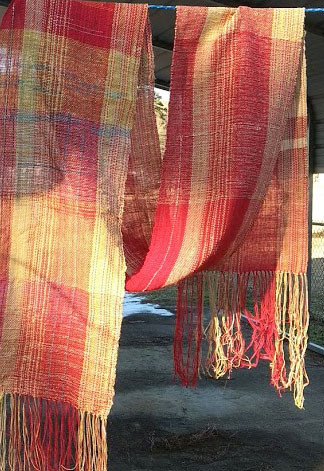 Back in November of last year I showed the beginnings of a "three color" fabric that I was weaving. 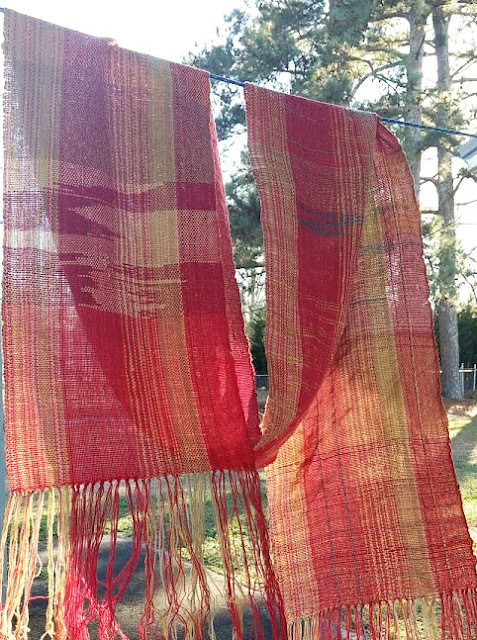 For a while, that was off the loom so that I could weave other things. Last night I put it back on the loom and wove on it for a while. Today I finished the weaving and took the fabric off the loom. This fabric has not been wet finished yet. For wet finishing my cotton cloth, I wash it and then iron it while still wet. Then it is hung to dry. As you can see we did have sunshine today. The temperature got up to 51 F. But it has fallen back below freezing this evening. You may also notice in the lower photo that there is still some snow remaining in the areas that did not get full sun during the day. Beautiful! I agree...come on Spring! That is a beautiful piece, Gene. It brings a little spring to your place :) I'm heading to Alexandria, VA to for 10-days...fortunately, they are supposed to be warming up. Pretty color combos. Looks like sunshine. Beautiful pieces. Thank you for sharing. It turned out really well Gene. My local guild is also doing this 3 colour challenge and some of the ladies are beginning to bring their completed works in for Show and Tell. Some of the most unlikely colour combinations are turning out quite striking and every participant is mentioning how it helped them think creatively and outside their usual comfort zone.